Stampers Anonymous Tim Holtz Stamps GIVEAWAY! Congratulations to Sylvie Hoobanoff – this week’s lucky winner. It is Why Not Win Wednesday folks! Today we have partnered up with the wonderful people over at Stampers Anonymous. One lucky winner will be taking home this collection of Tim Holtz for Stampers Anonymous stamps AND stamping blocks! WHY NOT YOU?!?!?!? You have until Friday, Jan 25th at midnight to enter to win! Great products by a great company! Thank you for the opportunity to win these stamps and blocks. Love these stamps! Thanks for a chance to win! What a great prize! Thanks for a chance to win! Love love love this set! thanks for the opportunity to win and thanks for the great magazine. Thanks for the chance to win all the lovely Tim Holtz goodies! Fantastic prize. Thanks for the chance. Thank you for this prize package! It’s pretty awesome! Those stamps are amazing!! Thanks for the chance to win! I’m so excited! I love Stampers Anonymous. Their company makes amazing products. Wonderful stamp company! Love the new products. Love stamping, these look great! I saw the post about contest via Stampers Anonymous FB page. Now I’m checking out your magazine which I didn’t know about! We don’t have local scrapbook stores in my area, but that doesn’t stop me from creating with stamps, inks, and photos. Thanks for the opportunity to enter contest and glad to know about your magazine now. love stampers anonymous and Tim Holtz!!! thanks for the chance to win these fantastic products! Love everything Stampers Anonymous / Tim Holtz designs!! thanks for the opportunity to win these stamps!! 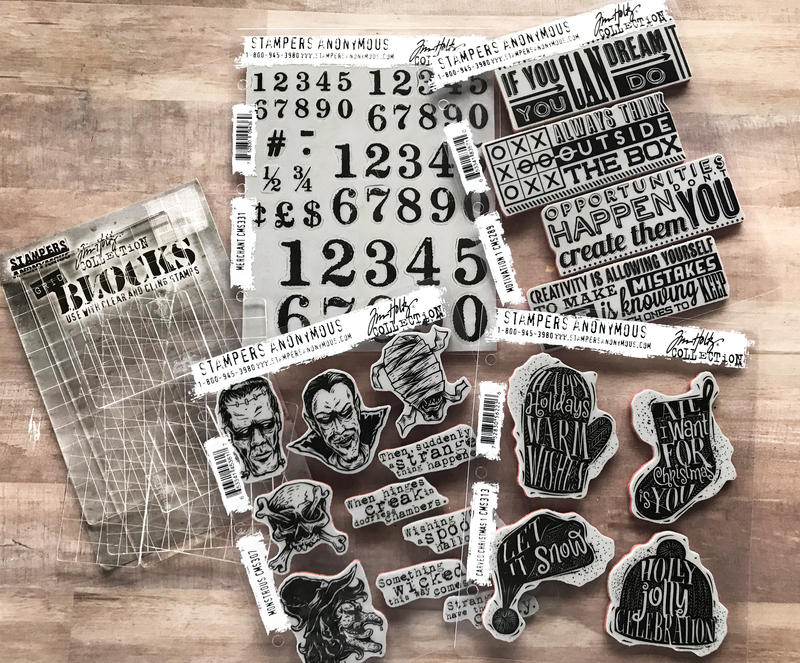 I love the collection of Tim Holtz for Stampers Anonymous and thank you for the giveaway! Again, Stampers Anonymous’ release is amazing. My collection of stamps grows… Thanks for sharing this gift, CS! Oooh I love SA stamps! They are some of my favourite! Love those stamps. Thank you for the chance to win. Awesome giveaway! Love Stampers Anonymous products. Thanks for the chance to win. Love Stampers Anonymous stamps! Very high quality stamps! Love the Tim Holtz line and Stampers Anonymous. Fabulous giveaway. So cool! Crossing my fingers, maybe I will be lucky at my b-day 😋 thanks for the chance. Hello from creative scrapbook magazine. I would like to win this prize as i need to increase my stamps and blocks but cannot afford it right now. I don’t have many of their stamps, but would love some. They are very detailed and so creative. Great fun for special unique cards and layouts. Thank you for the opportunity! I left the comment on their Facebook. I LOVE their stamps, and love to watch Tim Holtz create with them at the Carson Rubber Stamp Shows!! Hi everyone. Have a great day. Love the stamps! Fabulous giveaway . Thanks for a chance to win! Thanks for the chance to win this giveaway…would make my day to win! Thanks for the contest, CSM! Love these stamps!! Thanks for the chance to win!! I would love to win these stamps! Thank you for the chance. Wow, these are so fun! I love the Halloween stamps. 🙂 Thanks for the chance to win! Some interesting stamps! Would love the opportunity to play with them. Who couldn’t use this prize pa Lahr in their lives!! ooooo would love to share these stamps with friends! Would love to share these stamps with friends! Thanks for the opportunity! Love All things Tim Holtz!!! Always fun to be had with Stampers Anonymous – thank you! Thanks for doing a nice giveaway! I really love that Halloween stamp by the way. Done. Thank you this is amazing from a great company and magazine. I am loving all the new products this year, and what a great prize pack to give away thank you for the chance. Love Tim Holtz and love Stampers Anonymous!!! Thank you for the opportunity to win these incredible stamps!!! Love these stamps! I am in love with TH goodies! Thanks for a chance to win! Who wouldn’t loke this prize package? I “lost”, my blocks at a crop…this would be wonderful to win! I love how these great companies come together. Creatice Scrapbooker,Stampers Anonymous and Tim Holtz! Yeah! What a fun giveaway of wonderful Tim products. Thanks Creative Scrapbooker Magazine. Love anything from Tim Holtz. Thanks for the chance to win! Sweet Tim Holtz Anonymous Stamps giveaway!! Thanks for the fab opportunity. Love the SA stamps!! Thanks for the chance to win those goodies! I love the stamps!!!! Hope to win. Thanks for the give away, Jackie. OMG! This set of awesome stamps and blocks would fit into my collection so very well. It would be so awesome for me (hint! Hint!) or some one to get this fabulous set of stsmps and blocks. Thanks for the chance to win. Love this give-away! Great Product! Tim Holts prizes are always great! Tim Holts goodies always welcome! Tim Holtz always has great stuff! Thanks for this opportunity to win! Thank you for the give away! So many options with these products. Wow what a great Wednesday prize. Fantastic products, can’t have enough!! Thank you for the chance to win some Awesome stamps by TIm Holtz ! Thanks for the wonderful opportunity to win! Hello. Thanks for the opportunity to maybe win these awesome stamps. Love Stampers Anonymous stamps. It would be wonderful to win some new ones.Thank you. Thank you for another amazing Wednesday!! Love this giveaway! I appreciate the chance to win these stamps and blocks! I watched Tim demo these on FB Live….such a fabulous collection. I would so love to win this week’s prize. Love Tim’s stamps….. thanks for the opportunity to win. It would be to create with all ! Great give away of great products! Thanks for the opportunity. Love to work on papercrafts. Awesome giveaway… Thanks for the chance to add some fun to my collection! Thank you for this. It is such a lovely giveaway. Yay it’s back! Cool stamps! Who doesn’t love Tim Holtz. Hello! Thank you for the opportunity to participate. You guys just make me all excited with these generous sponsors. Thank you so much for the chance to win this awesome prize! Love Creative Scrapbooker Magazine and Stampers Anonymous! What a fantastic prize, Creative Scrapbooker Magazine! This would be so fun to create with! Would love to win this pack ! Thanks Stampers Anonymous and Creative Scrapbooker Magazine ! Im so in love with ALL the products! The images are sp intricate and beautiful. I love the uniqueness! Love Stampers Anonymous and anything Tim Holtz! What a fun giveaway ! Thank you for the opportunity!! I love using all the Tim Holtz products!!!! What a lovely giveaway. Love the stamps. Love his new items! The releases just get better every time. Right up my alley! LOVE these sets! I dropped by their FB page and said hi from CSM! Thank you for the chance to win! I’m a forever fan of Tim Holtz and Stampers Anonymous! Thanks for the chance to win some great products! Thank you so much for the opportunity! Would be amazingnto add these to my small supply stash! LOVE the monster one!!! Thanks for the chance to win!! I love to scrapbook, and our town doesn’t have any stores that carry any scrapbooking supplies, so this would be a fantastic prize to win! Thank you for the chance!! What a great prize package. Thank you for the opportunity to enter. Thank you to CSM and Stampers Anonymous for the chance to win. FYI the link to Stampers Anonymous didnt work. As soon as I clicked on the Posts tab it said no internet connection but I am definately connected. I went out of the link and found the page on my own and it worked fine. Hello! Fingers crossed! Love this! These are amazing stamps!!! I would love to add these to my collection! I just started making cards and scrapbook picture frames. Some great stamp sets here!! Would love to win!! Thanks CSM and Stampendous for the chance to win!! These are amazing. The Stampers Anonymous stamps I’ve seen look great. Thank you for a chance to win. Have a wonderful day. Here I am wanting to win again! You create so much fun! Wow, love all the new products. Thanks for the chance to win! Love Stampers Anonymous! Love seeing Ted at the conventions and Tim Holtz is such a great guy too!!! Happy Wednesday! Lovely stamp designs!! Done! Such a great prize to win. Thanks for continuing to put Why Not Win Wednesday together and organizing such great prizes! YES Please! Why not Eh? What a great prize. Have visited Stakkers Anonymous on Facebook. What a great prize. Have visited Stampers Anonymous on Facebook. I love Stampers Anonymous! What a great giveaway. Thank you! Tim Holtz has a fantastic design eye. Love seeing all the great products you show! Oh my word … love love love those monsters/mummies! Come play on my stampin’ table, please! WOW what an AWESOME giveaway – one lucky person out there !!! I love anything Tim Holtz. Thanks for an awesome giveaway. Love working with Stampers Anonymous stamps. And your mag. is one of the best. Who is still drinking in videos from Creativation? I certainly am! Thanks for the opportunity for a Stampers Anonymous give away! Who wouldn’t love to have that prize it is generous! Thx for the chance to win!! Thank you for the opportunity to win a really great Prize! Thank by you for introducing some great stamps. I watched some of Tim Holtz’s product releases from Creativation. Love the new stuff,. I started a new Wish List. I got to see these new stamps at Creativation – I cannot WAIT to get them all!!!!! Would LOVE to win this package! Love all of Tim”s Stampers Anonymous stuff! What a great set of stamps! I love the cozy hats and mittens! Wonderful prize. Thank you for the chance to win. What a great, diverse giveaway! You could use all the these stamps (and blocks) many times over! Thanks! Looking forward to all the new stuff that Stamper’s Anonymous will be releasing soon!!! I never knew there was a Facebook page! Thank you so much for sharing this! Hope I win —those look like a fun bunch of stamps! Kararina oh my gosh, the Stampendous 2019 line is out of this world! How will I ever pay my mortgage! Hi! What a great prize!!! Thanks for the chance to win!! Awesome giveaway! I would love to win this and share it with my friends. Thank you for the chance to win. Love my Stampers Anonymous! Stamps 😀 Best red rubber. Best storage. Just the best. Lovely and always so inspiring and such unique themes! What an excit No giveaway. Someone is gonna be very lucky! Oooohhh! What a wonderful assortment of stamps! Thank you for the chance to win them! I ❤️ Stampers Anonymous! Thanks for the chance to win! What a fabulous prize! Fingers and toes crossed! I LOVE Stampers Anonymous, this would be amazing to win, thank you so much for the chance! What a nice giveaway. Thank you for the opportunity to win. Always FUN!!! Thanks for the opportunity! Looks like a FUN stamp set! Thank You !!! awesome stamps, hope I have a chance to play with them! Love the new products. Would love to win !! !